In ITER, beryllium will be used as armour for the plasma-facing first wall panels fitted inside the Tokamak. This metal has been chosen in major part for its good thermal properties—that can accommodate the high heat fluxes on the first wall (up to 5 MW/m2)—and its low atomic number that, in case of plasma contamination, minimizes radiation heat loss that could otherwise lead to unacceptable cooling of the hot fusion plasma. Planning is underway now at the ITER Organization to put in place the management program that will provide for the safe handling of beryllium and a healthy work environment. The objective of the three-day Beryllium Workshop at ITER Headquarters was to clearly identify the ITER Organization internationally as a major user of beryllium products and a major beryllium actor in the coming decades. ITER will operate with beryllium-bearing components and in particular, the plasma-facing first wall of the blanket, which will require about 12 tonnes of beryllium to cover a surface of approximately 610 m². The beryllium used in the manufacture of ITER components will be non-radioactive; however, measures, systems and actions shall be implemented to control and prevent any beryllium exposure to workers, operators and the public. Classified as a potential carcinogenic, the primary risk with beryllium is the inhalation of beryllium dust. The ITER Organization is committed to providing a healthy and safe worksite and work environment through a detailed beryllium safety program. The ITER Beryllium Management Committee (IBMC) was established in 2015 to ensure the ongoing effectiveness of the program in delivering the working environment demanded by all stakeholders and in compliance with the ITER Agreement*. The IBMC is chaired by Blanket Section Leader Rene Raffray supported by Russell Eaton (Blanket Officer) as Technical Secretary, and includes the participation of Legal Affairs, the Committee for Health & Safety, Human Resources, Responsible Officers for components containing beryllium, beryllium-procuring Domestic Agencies, the Occupational Doctor, and ITER business units for assembly, operations, and radiological and environmental monitoring. Beryllium, used in the plasma-facing first wall of the ITER blanket, must be managed through a detailed beryllium safety program. From 28 to 30 June, representatives of beryllium suppliers, manufacturers and users shared their experience with the ITER Organization and the Domestic Agencies responsible for components containing beryllium. The focus of the IBMC in 2017 has been to set up the ITER beryllium worker identification process and training program, to identify and produce the needed beryllium documentation and—with the support of the ITER Director-General—to organize a workshop on beryllium applications and health and safety. The workshop, held on 28-30 June at ITER Headquarters, attracted 103 participants including nearly half from outside of the Organization, representing the Domestic Agencies, international organizations, beryllium suppliers and manufacturers, and users from China, Europe, Japan, Kazakhstan, Korea, Russia and the US. The objective of the three-day session was to clearly identify the ITER Organization internationally as a major user of beryllium products and a major beryllium actor in the coming decades; to share the Organization's plan on dealing with beryllium issues and to receive feedback from international actors in the field; to learn from those who have experience in the areas of beryllium facility design, on-site operation, monitoring and training; and finally to demonstrate transparency on the ITER approach to beryllium safety. 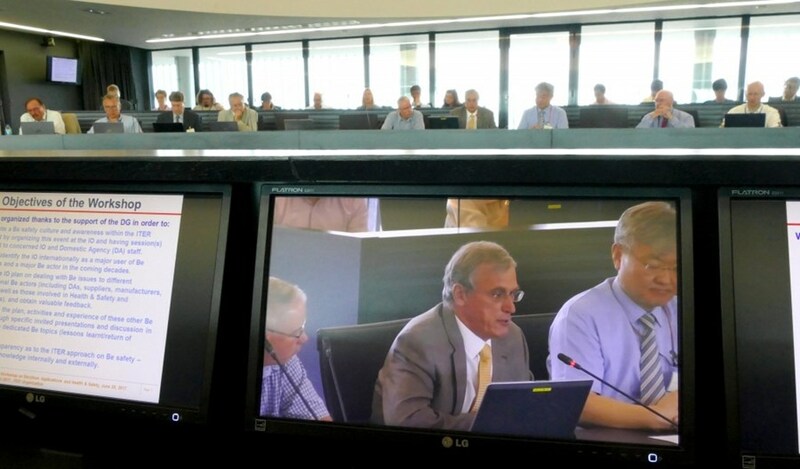 In his presentation to the opening session, the ITER Director-General emphasized that protection of the stakeholders is an essential and top priority for the ITER Organization, before thanking the external participants for sharing their valuable experience and lessons learned in order to help the ITER Organization establish a robust and effective beryllium management worker protection program. Information from the workshop will be particularly useful over the next year to help the IBMC improve the ITER beryllium training program and develop an ITER beryllium "code of practice." * Due to the nuclear nature of the activities carried out by the ITER Organization, the Parties to the ITER Agreement stipulated that the ITER Organization shall observe applicable national laws and regulations of the Host State (France) in the fields of public and occupational health and safety, nuclear safety, radiation protection, licensing, nuclear substances, environmental protection and protection from acts of malevolence (Article 14).